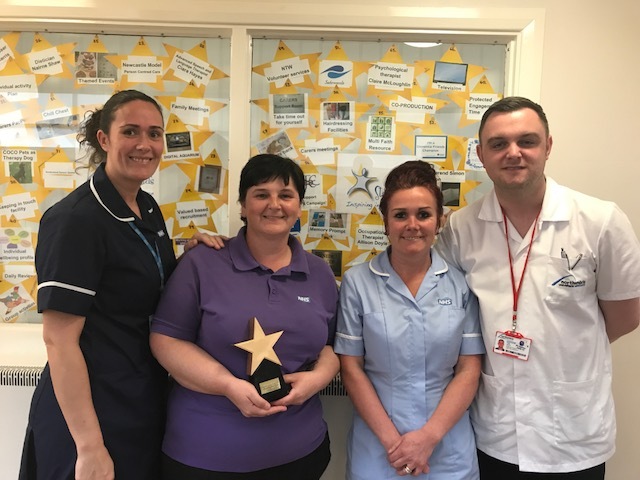 Marsden ward is part of a growing group of new fab Full Monty award winners at Northumberland Tyne & Wear NHS Foundation Trust! We were delighted to recently visit the older persons in Sunderland present the team with their much deserved Full Monty award. I was blown away by their boundless enthusiasm, creativity and dedication to giving their patients a personalised experience of care. Marie (Ward Manager), Laura (Carers Champion) and Wendy (Activities Coordinator) were happy to be our tour guides of the fantastic work being carried out by themselves and the other superstar staff on Marsden. It was obvious that the therapeutic activities offered are all beautifully customised for the particular patient group. The staff go the extra mile to get to know each person’s life journey, actively centring the 75 Star Wards ideas around them and their carers. Here you can see a small part of their display showing how they did this – it’s on the ward for everyone to see and get involved. On our tour, Wendy who introduced us to their impressive digital reminiscence technology in the form of the ‘My Life’ app installed on tablets. This incredible app has an array of engaging activities available at the touch of a button which allows for personalised patient profiles which include; music for all tastes, speeches from famous people, key historical events, and the very popular coconut shy game! These are just a few of the features which staff can use (without training!) with patients on a one-to-one basis to provide reassurance and distraction. ‘Living in the moment with us’, is the phrase the team uses to describe their approach to engagement. As Nic Higham (Star Ward’s Inpatient Care Project Manager) and I began our walk around the ward, we firstly visited the ward’s entrance where the brightly painted carer area was filled with information to keep carers informed and involved about the ward. In the entrance area was also a display of forget-me-not flowers which all had positive and helpful advice for new, current patients and their carers. During our walk round of the ward, Marie and Wendy showed us that personalised and engaging activity comes in lots of other forms for patients on and off the ward. ‘Memory Books’ and ‘This is Me’ displays were clearly presented in each patient bedroom. Available at a glance and in the case of the memory books accessible anywhere on the ward. Both resources are lovingly put together by patients, staff and carers the memory books and this is me boards were filled with comforting pictures of loved ones, valuable memories and places of interest. As you’ll know by visiting our new website Animal Magic, we love residential and visiting pets! Creative ways of achieving this are always very welcome too. Marsden Ward love to see Coco their PAT Dog visitor. They’ve also put in place regular (constant!) animal contact via a ‘digital aquarium’ in their chill out area. This is TV fixed to the wall playing a relaxing fishy DVD on repeat. Now that’s frugal innovation, and no maintenance, either! The view of the fish was paired with the easily accessible ‘chill chest’ which was full of items to help calm and relax – simple yet so effective and all put together by Wendy who is (probably) Poundland’s favourite customer! Trying to decide which of the amazing activities to include in this blog was a real challenge because there was so much fantastic stuff happening! In their jam-packed Full Monty application, Marie summed up this well as a fabulous ‘wealth of activity and engagement’ – we at Star Wards could not agree more! Well done lovely people.